2 Prepare Pasta & Sauce according to directions on pack, using water, milk and spread, and set aside. 3 In a large bowl, lightly beat eggs. Add remaining ingredients and the prepared Alfredo Pasta & Sauce, stir until combined. 4 Spoon mixture into lightly greased mini muffin pans and bake for about 12 minutes, or until frittatas are set and lightly browned. Allow to stand in pan for 3-5 minutes before removing. 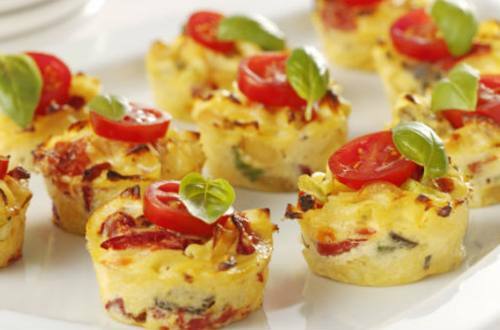 5 Serve frittatas warm. If desired top with a slice of cherry tomato and a basil leaf.